Freedom of conscience in Europe? An analysis of three cases of midwives with conscientious objection to abortion. Fleming V, Ramsayer B, Škodič Zakšek T.
doi: 10.1136/medethics-2016-103529. Epub 2017 Jul 29. While abortion has been legal in most developed countries for many years, the topic remains controversial. A major area of controversy concerns women’s rights vis-a-vis the rights of health professionals to opt out of providing the service on conscience grounds. Although scholars from various disciplines have addressed this issue in the literature, there is a lack of empirical research on the topic. This paper provides a documentary analysis of three examples of conscientious objection on religious grounds to performing abortion-related care by midwives in different Member States of the European Union, two of which have resulted in legal action. 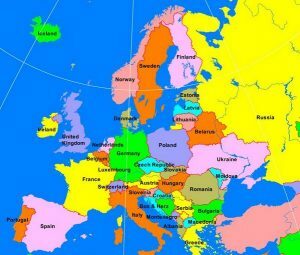 These examples show that as well as the laws of the respective countries and the European Union, professional and church law each played a part in the decisions made. However, support from both professional and religious sources was inconsistent both within and between the examples. The authors conclude that there is a need for clear guidelines at both local and pan-European level for health professionals and recommend a European-wide forum to develop and test them. Health Hum Rights. 2017 Jun; 19(1): 55–68. Heino A, Gissler M, Apter D, Fiala C.
The issue of conscientious objection (CO) arises in healthcare when doctors and nurses refuse to have any involvement in the provision of treatment of certain patients due to their religious or moral beliefs. Most commonly CO is invoked when it comes to induced abortion. 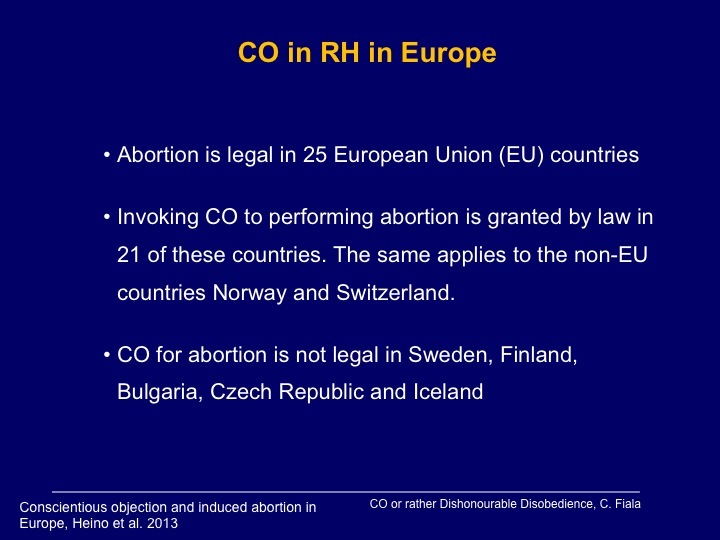 Of the EU member states where induced abortion is legal, invoking CO is granted by law in 21 countries. The same applies to the non-EU countries Norway and Switzerland. CO is not legally granted in the EU member states Sweden, Finland, Bulgaria and the Czech Republic. The Icelandic legislation provides no right to CO either. European examples prove that the recommendation that CO should not prevent women from accessing services fails in a number of cases. CO puts women in an unequal position depending on their place of residence, socio-economic status and income. CO should not be presented as a question that relates only to health professionals and their rights. CO mainly concerns women as it has very real consequences for their reproductive health and rights. 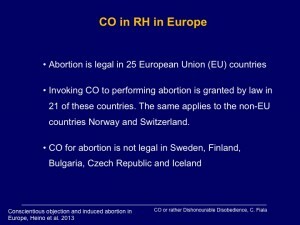 European countries should assess the laws governing CO and its effects on women’s rights. CO should not be used as a subtle method for limiting the legal right to healthcare.